Powers/Abilities: Sunquist claims to be solar-powered. He possesses a variety of elven powers, including the ability to animate toys and to rearrange matter. He was also a pretty good shot with a handgun. (Howard the Duck II#3 (fb)) - Sunquist is one of the Elves of the North Pole. He originally hailed from Florida. 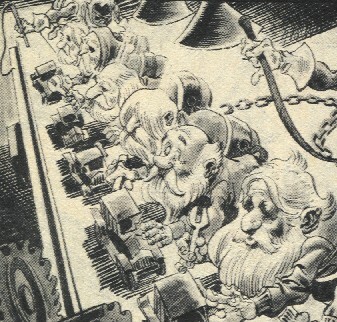 Upon relocating to the North Pole under the employment of Santa Claus, he quickly became a trusted advisor. 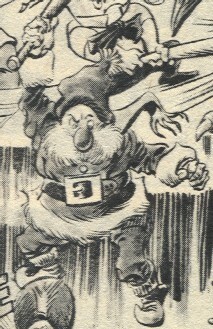 Sunquist encouraged Santa to cut his reliance on fossil fuels (which powered Santa's sleigh; see comments), recommending wind or solar power instead. In addition he discouraged Santa from allowing the construction of the North Pole Nuclear Power Facility (he again recommended solar power), but another worker, Pinball Lizard, made sure that Santa did not listen to Sunquist. At some point he became a member of ELF, the Elf Labor Federation, which protected Elves--an exploited minority--such that they might offer their services only to the extent that they did not cause humanity to become unduly reliant on elfkind. (Howard the Duck II#3) - Sunquist was aboard Santa's sleigh when it crashed in Cleveland, its fuel having been drained by Pinball Lizard as part of a plot to ruin Christmas. Howard the Duck and Carol Starkowitz helped them bring the sleigh to Howard's cab company to refuel, though Sunquist's contract forbid him to assist in pushing it up the hill. He returned to the North Pole with Santa, Howard, and Carol, where they learned that the Pinball Lizard had taken over Santa's Workshop and refused to allow them in. After Howard used a toy cannon to blast the door open, Sunquist and Santa led the animated toys to fight Pinball Lizard and his Trolls. When Pinball took off in his zeppelin, he destroyed Santa's sleigh, and Sunquist was forced to join the others in the long trek to the Nuclear Power plant to which Pinball had fled. Their journey was made much easier with the assistance of their ally Ollakook and his dogsled. Upon arriving, Sunquist wielded a bat against Greedy Killerwatt's mutates, but he later headed off on the track of Greedy himself. 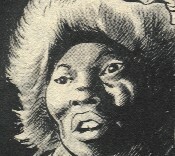 Greedy overwhelmed Howard and Carol, but Sunquist shot him in the head, shattering Greedy's lightbulb like head. This ended the threat as all of Greedy's mutates returned to normal. Having learned his lesson, Santa followed Sunquist's advice and decided to convert his Workshop to solar power and his sleigh to using organic fuels. In celebration, Sunquist indulged his magical powers and transformed Ollakook into a new sleigh for Santa. After dropping Howard and Carol back in Cleveland, Sunquist road one of the huskies as they pulled Santa's flying sleigh back to the North Pole. Santa's reindeer can truly fly, but the ASPCA made a law that the sleigh had to fly under its own steam. The reindeer are allowed to soar on ahead once a year: Christmas Eve. In the past, it was steam driven, but Santa was convinced by a man from the oil company to switch to high octane fuel. They are also known as Fairies, though that name became much less popular after "some blamed woman made the term unpopular." The exact origins of the Elves of the North Pole are unknown. They may be related to one of the races of elves listed above, or they may each come from different backgrounds, being magically empowered by Santa. 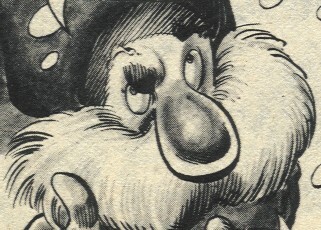 Several of the Elves were transformed into Trolls by Greedy Killerwatt and working under the control of Pinball Lizard. With the demise of Killerwatt, they returned to normal. They work in Santa's workshop, building toys for children. They are able to magically animate these toys. They all may or may not possess matter transformation powers as does Sunquist. Sydney was the only other Elf identified by name. An Inuit dogsledder, he came to Santa's rescue when his sleigh was destroyed, using his pack of huskies to speed his journey to the North Pole Nuclear Power Plant. Claiming that his people received more nuclear radiation than those whom received power from the plants, he was most pleased when Santa turned away from nuclear power. His sled was later turned into a new sleigh to replace Santa's which had been destroyed by Pinball Lizard.